During the April 20, 2017, DELDN meeting, attendees were able to participate and share resources at Round Table discussions. Topics covered a wide range of subjects, including: "Motivating Staff", "Family Engagement", "Time Management", "Theme Implementation", "Staff Training Handbook", "Promoting Health & Fitness" and "Menu Planning." During the March 16, 2017, DELDN meeting, Susan Main, President and CEO of the ELC of Duval, along with Anna Brosche, At-Large-Group 1 City Council, presented updates on legislative issues for 2017, Bills of Interests and the Governor's Budget. Providers were given ELC Legislative Priorities and were equipped with the information they need to travel to Tallahassee for Children's Day and interact with legislators. During the January 19, 2017, DELDN meeting, Patrick Capriola and Stephanie Cugini from Early Learning Florida, discussed ways to connect and educate the early learning workforce in Florida to promote healthy child learning and development. Participants learned how to improve their practices by using high quality resources and courses. 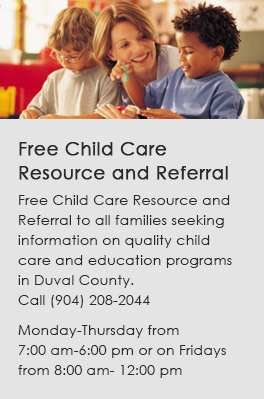 Early Learning Florida also supports directors/owners in their efforts to improve their center or home child care environment. During the October 20, 2016 DELDN meeting, at Florida State College at Jacksonville, Mala Ramoutar discussed new background screening requirements, as per Chapter 402.305(15). Changes include additions to "Level 2 Screenings" and "Employment History Checks" for proceeding 5 years. The DELDN 2016 Summer Conference was a huge success. Guest Speaker, Cynthia Ulrich Tobias, M. Ed., Apple St. Applied Learning Styles, engaged the audience with humor and thoughtful insight. Among her presentations, "You Can't Make Me, (But I Can Be Persuaded)," dealing with children's challenging behaviors.